A new mobile adapter providing a quick, simple and low-cost method in optical care imaging could make today’s smartphone a common diagnostic tool for eye healthcare professionals. 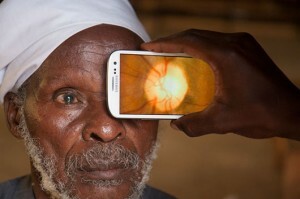 A report in the March 2014 Journal of Mobile Technology reveals the new adapter, which can be easily connected to a smartphone, eliminates the need of the slitlamp technology now used in documenting ocular pathology and imaging of the anterior segment of the eye. “Think Instagram for the eye,” said one of the developers, Robert Chang, M.D., in an announcement. The report states the adapter provides “useful clinical information regarding the appearance of the lids and lashes, the clarity of the cornea, the state of the conjunctiva, the shape of the pupil and health of the iris and the presence or absence of a hyphema or hypopyon,” and can be used in emergency triage and teleophthalmology in various settings. The mobile optical tech advancement comes as healthcare providers, physicians and payers are seeking ways to save costs using emerging technologies and mobile diagnostic tools. According to the announcement, the initial adapters will be available for purchase for research purposes only while the team seeks guidance from the Food and Drug Administration. The researchers said the production cost is under $90 but the goal is to make it even lower in the future. You can learn more about retinal imaging here http://www.eye-contact.co.uk/retinal-imaging/ or you can contact us.